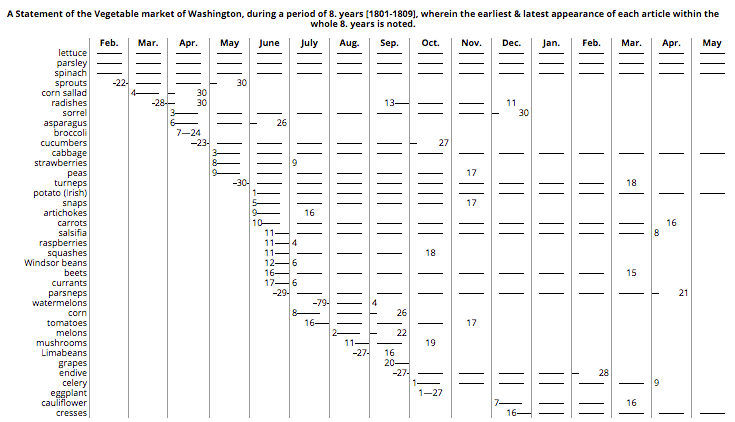 Because I’ll not be out-geeked by a two-centuries-dead president, I’ve made an HTML version of Jefferson’s chart. His handwritten original was quite clever (you can see it at low resolution on the Monticello website) and I’ve preserved the basic design while adding a bit of interactivity: for now just the ability to mouse over headings to highlight rows and columns, but eventually also to view definitions and commentary on various items of produce. This is only a screen shot; view the live version here. Despite the deservedly bad reputation of most early American farmers and the technology-fired notions of “progressive” farmers in the twentieth century, some gardeners, at least, were able to grow vegetables for market over surprisingly long seasons in 1800. Lettuce, spinach, and parsley were available year-round. Cucumbers appeared as early as April. And who grows artichokes commercially on the Chesapeake at all nowadays? Clearly, then, gardeners were using some methods of season extension — hot beds and cold frames, as well as cold storage for long-keeping items like cabbages and potatoes. That said, the bars represent the longest possible season for each item; they begin with the earliest date the item appeared over eight years and end with the latest date its season ended. One early spring and one warm fall, years apart, could make some seasons appear two months longer than in any given year they actually were. Additionally, we don’t know how much of any given item was available out of its normal season (e.g. lettuce in January), or what it cost. Given what I know of early nineteenth-century hot-bed technology (of which I’ll say more in a later post — I know you can’t wait), it was likely quite expensive. We also don’t know what the quality was like — but given the alternative of eating root-cellared turnips and sauerkraut, I imagine people took what they could get. Some fairly obvious items aren’t listed — apples, for example. This doesn’t seem to be a complete list of produce available in Washington. Finally, it’s worth noting that Washington was a very new city in 1801; the White House wasn’t ready for occupancy until November, 1800, just five months before Jefferson was sworn in. Was there a market in Alexandria prior to 1800, and did market gardeners ramp up production when the Federals showed up? Who were these market gardeners? Were they specialists? Planters who expanded their domestic operations? Women selling vegetables and herbs on the side, along with butter and eggs? I’ll have more to say about this chart in later posts as I do more research into the gardening of that time. I’m also planning to do a version of Jefferson’s chart for a local farmers market in the last decade, for comparison. Hello, David! You have won the Liebster Blog Award, which is given by one blogger to another for outstanding work. Please see the announcement on my blog at agardenerstable.com.